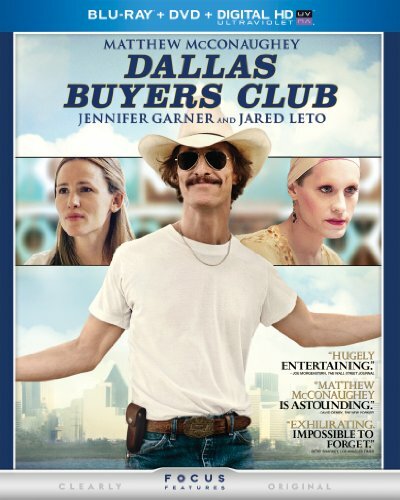 DALLAS BUYERS CLUB starring Golden Globe(R) winners Matthew McConaughey and Jared Leto arrives on Blu-ray & DVD February 4th. Universal City, California, January 13, 2014 -- Golden Globe Award(R) winner Matthew McConaughey (Mud, Magic Mike) delivers a career-defining performance as Texas cowboy Ron Woodroof in the "hugely entertaining" Dallas Buyers Club , the inspiring and powerful story of an imperfect man's fight for survival during an uncertain time in America (Joe Morgenstern, Wall Street Journal). Directed by Jean-Marc Vallee (The Young Victoria) Dallas Buyers Club arrives on Blu-ray(TM) Combo Pack including Blu-ray(TM), DVD, & DIGITAL HD with UltraViolet(TM) and On Demand on February 4, 2014, from Universal Studios Home Entertainment. Texas cowboy Ron Woodroof (McConaughey) sees his free-wheeling life overturned when he's diagnosed as HIV-positive and given 30 days to live. Determined to survive, Woodroof decides to take matters in his own hands by tracking down alternative treatments from all over the world by means both legal and illegal. After his journey to find a cure leads him to an unlikely ally in Rayon played by Golden Globe Award(R) winner Jared Leto (Lord of War, Alexander), he establishes a hugely successful "buyers' club" and unites a band of outcasts in a struggle for dignity and acceptance that inspires in ways no one could have imagined. Also starring Jennifer Garner (The Odd Life of Timothy Green), Denis O'Hare (J. Edgar) and Steve Zahn (Diary of a Wimpy Kid), Dallas Buyers Club is "deeply moving. A livewire of a movie!" (Peter Travers, Rolling Stone).